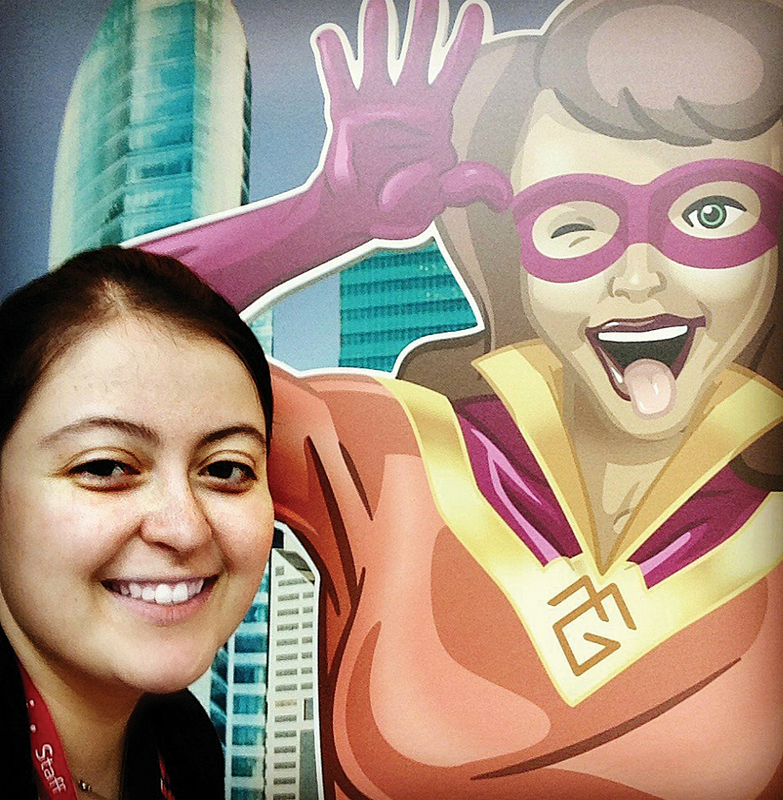 Katherine Desy with Mapgirl at the Esri UC. Katherine Desy was one of 105 summer interns at Esri. She worked on the strategic marketing team at Esri's headquarters in Redlands, California. She is currently finishing her bachelor's degree in marketing and entrepreneurship at Syracuse University in New York. In this article, she shares her impressions of two days she spent at the Esri User Conference (Esri UC). To sum up my internship, all I can say is…incredible. Interns were given the opportunity to travel for a day down to the Esri User Conference, which is probably something we were most looking forward to. I was lucky enough to spend two days in San Diego taking pictures, interviewing conference student assistants, and just enjoying what Esri UC has to offer. Obviously, having started at Esri a month and a half before the conference, I heard a significant amount about what it was like. I had an idea of what to expect, but I didn't quite realize the magnitude until I got to San Diego. Here are a few of my observations. Even if you know next to nothing about GIS, the conference is still wicked cool. I sat in on a technical session that talked about using Esri Maps for Office. Even with little working knowledge of ArcGIS, I will now be able to use maps in my Word documents, Excel spreadsheets, and presentations. And let me say, I do a lot of presentations at school, so now I can blow people away with my interactive maps! Just walking around the conference, especially in the exhibit halls, you get a real sense of how cool GIS is. I saw flying drones, a giant display of sea-level temperature, 3D adventures using the Oculus Rift, and so much more. Coming into Esri, I had no idea of the kind of impact GIS had on the world. But seeing everything at the conference made me realize GIS is pretty much everywhere you look, and that's pretty neat. As someone who wants to be in the marketing field, I found the Tapestry Segmentation booth to be fascinating. The location analytics team at Esri has classified US neighborhoods into 67 unique segments based on demographic and socioeconomic characteristics. For someone in marketing, sales, retail, or virtually any business that deals with customers, this package is the epitome of usefulness. There's even an app that breaks down the types of people based on ZIP code (and by street block if you have an ArcGIS subscription). You can literally receive data down to the block level for anywhere in the country. To me, that's mind-blowing. Whether or not I end up at Esri full time in a year, I will certainly be using Tapestry for the rest of my life. I hope everyone else had a great time at Esri UC! Maybe I'll be back again next year to write another guest post but as a full-time employee.